OnePlus will announce the OnePlus 6 next week in London and the company has updated its trade-in program landing page in anticipation. Those who want to trade in their current OnePlus devices to get credit towards the upcoming OnePlus 6 will be able to begin the registration process now. The bad news is that only European residents can participate in the trade-in program. The program is available for those markets in Europe that user either of the following three currencies: Euro, Swedish Krona, and British Pound. The max amount offered for a trade-in is €280 (about $330) depending on the model and trade-in condition. Of course, the second step in the process is grayed out, since the phone isn't available to purchase yet. 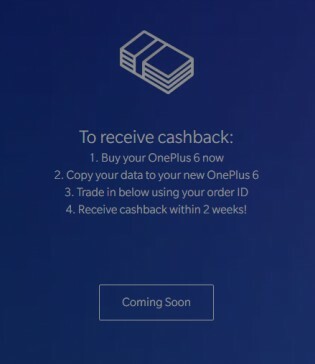 Once you’ve signed up for the trade-in, you’ll receive a voucher that you can use towards the new OnePlus 6. Once received, transfer your data to the new device and send back your old one. Based on the wording of the website, it looks like you’ll still have to pay in full for the OnePlus 6 until your trade-in is processed. Who is upgrading their OnePlus device to the OnePlus 6? Let us know in the comments! 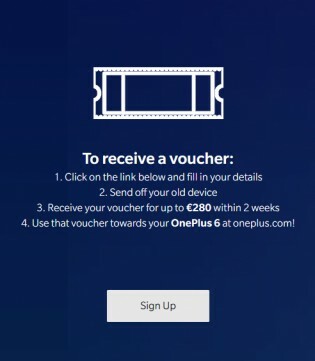 Check out the Source link for more information from OnePlus on how the trade-in program works. If they're offering such a trade-in, then most probably Oneplus 6 price would be bloated and not reflect its real value. Another price increase for Oneplus - making its existence obsolete!